With the amount of work on our plates having reached such unsustainable levels, we start each work-day anxious about how to get it all done, relegating which important tasks will have to be sacrificed—again—just to keep our heads above water. We attempt to tackle our seemingly endless to-do lists by trying to focus on getting more done in less time. New York NeuroLeadership Institute Research Director & NeuroCoach Josh Davis, Ph.D. (media features include CBS News, MSNBC, USA Today, Bloomberg Businessweek, CNN and more) says we’re going about it all wrong, and argues the answer is not to get more done faster, but to create optimal conditions for at least two awesome hours of peak productivity each day. Drawing on neuroscience and psychology research, Davis explains that our minds operate according to complex factors that can make us truly effective when leveraged properly. Employing the above optimize our psychological and biological systems and make us capable of impressive feats of comprehension, motivation, and performance. As a registered nurse, Paige Cartledge has seen her share of pain through her patients. When a fellow nurse was diagnosed with a terminal illness, Paige began writing her book, “God Opened the Gate for Me,” so her sick coworker could read words of encouragement whenever he needed them. Since then, Paige realized many of her patients who were struggling with illnesses could also benefit from the daily devotions included in her book. “When you just need a little time with God, you can pull out this book and see relaxing pictures of His creation and read words of comfort,” Paige said. Paige Cartledge, who writes under the penname Victoria Breschan, is a registered nurse who lives on her family’s farm in North Carolina with her husband and two dogs. She has a bachelor’s degree in nursing from Barton College. She is a founding member of The Barnabas Club, a group of prayer warriors who are focused on uplifting the spiritual and physical needs within the church body and local community (http://thebarnabasclub.com). “We offer anyone who is interested a layman’s description of sleep apnea and inform them properly about the alternatives to CPAP, which we feel are easier and more effective,” Dillard said. Common signs of sleep apnea include loud snoring, waking up throughout the night, and waking up exhausted. Until now, it has been common practice for sufferers of sleep apnea to seek treatment, only to receive inconvenient CPAP therapy. Dillard and Patel want to emphasize the alternative options that can drastically improve quality of life for sleep apnea sufferers across the country. “Freedom from CPAP” offers the how-to guide that any sleep apnea patient or their spouse should read immediately. Countless Americans dream of pulling up stakes and moving abroad to immerse themselves in the cultures of the world’s great cities – London, Paris, Rome. But how many actually make the leap, and what is it like for them? In Under Paris Rooftops, published by Chateau Publishing House, Norman and Arleen Shabel bring readers along on their quest to fulfill a long-held dream of becoming part-time expatriates in the City of Light, and in doing so challenge and strengthen their marriage and their trust in each other. In Under Paris Rooftops, the Shabels detail their fascination with Paris, and their resulting decision to make a spontaneous trek to France and begin a confusing and potentially disastrous hunt for an apartment in the city guided only by Arleen’s understanding of the French language and careful planning. Along the way, the Shabels strengthen their more than 50-year bond by learning to appreciate each other’s strengths and weaknesses and trust each other more completely. And as they learn more about themselves, each other and a city with a rich and turbulent relationship with the Jewish religion, Norman and Arleen also realize an even greater respect for their trust in each other, which is the foundation of their marriage. Under Paris Rooftops chronicles the Shabels’ exciting Parisian adventure, including the challenges of a post-recession real estate market, a flexible currency exchange rate, and learning a foreign language, as well as the undeniable pleasures of a fresh-baked baguette and French cuisine. Follow along as they carry readers through the challenges of construction in a foreign city, the strolls through the boulevards and the rewards that came with their own expatriate adventure, as they experienced an incredible environment for artistic and literary development. The Taste of Home Cookbook: Busy-Family Edition (Sept.9; $29.99) is a great present for wonderful working parents and industrious cooks. Inside the Busy-Family Edition you’ll discover over 1,200 best-loved recipes from today’s home cooks. Whether you need a quick after-school snack, no-fuss lunch or hurry-up supper, the Taste of Home Cookbook has you covered. You’ll also find hundreds of effortless holiday entrees, simply sensational desserts and easy ideas for entertaining all year long. These tried-and-true recipes, tested in the Taste of Home Test Kitchen, are sure to become mealtime staples in homes coast to coast. Best of all, home cooks can quickly find the recipes they need with the new Busy-Family Icons: 5-Ingredient Recipes, Slow Cooker Recipes, Fast Fix Recipes and Freezer Recipes. 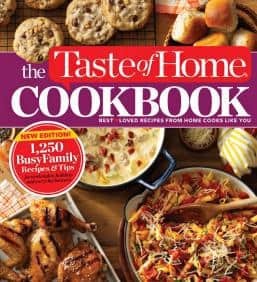 The Taste of Home Cookbook: Busy-Family Edition cover image is included. Review copies of Busy-Family Edition will be available in August.